Visitors of your website may find it useful to spot practical information in the upper part of the front page. They might find here all they need to get in touch with your business. Thus, Materialis PRO includes some options to set a top bar for the front page and customize it accordingly. Go to the Customizer -> Navigation -> Top Bar. In this subsection, you decide whether to display a top bar on the front page or not. 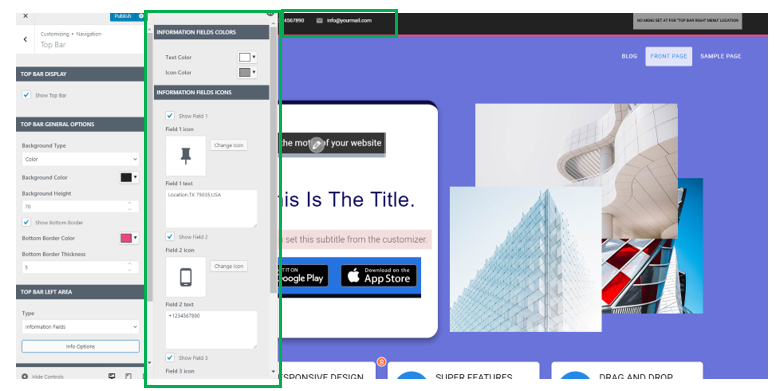 By checking the checkbox to Show Top Bar, you will include the top bar element in the front page and you can start customizing it. From here, you define the overall aspect of the top bar. Gradient (choose the gradient you want, from the list of available gradients). From here, you define the height of the top bar background, which equals the top bar “thickness”. For design purposes, you might want to clearly delimit the top bar from the rest of the page. In this case, you will enable the option to Show Bottom Border. 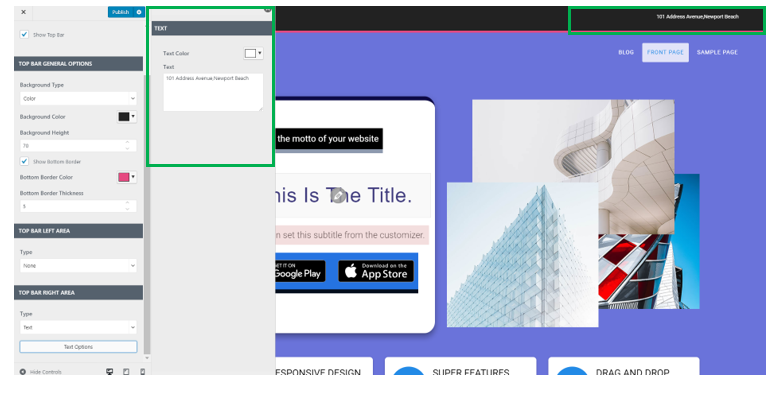 If you have activated the option to show a bottom border, you might want to apply a certain color to it, in accordance with the overall design. Select the color you want from the panel containing the color palette. Note that the bottom border color will only be visible if you set it to a different nuance than the rest of the front-page background color. A supplemental option for the top bar is to decide upon a certain thickness of the bottom border. Also, the bottom border color will be more visible if you set a greater thickness of this border. If you select None for the left area of the top bar, no element will be displayed here. This will balance with the inclusion in the top bar right area of the items you find most useful for the visitors. If you select this type of elements to include in the top bar left area, there will be some additional options for customizing them. Choose to integrate social icons in the top bar left area, and you’ll have the possibility to customize them according to your design. Provide the link to the corresponding account in the social network, for each element in this area. Select the option to integrate a menu in the top bar left area, and you will have additional customization options for the respective menu. If you select None for the right area of the top bar, no element will be displayed here. This will balance with the inclusion in the top bar left area of the items you find most useful for the visitors. 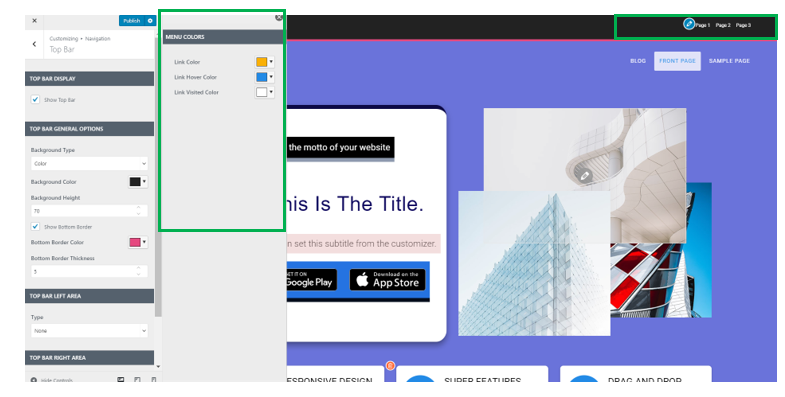 If you select this type of elements you want to include in the top bar right area, there will be some additional options for customizing them. Choose to integrate social icons in the top bar right area, and you’ll have the possibility to customize them according to your design. Select the option to integrate a menu in the top bar right area, and you will have additional customization options for the respective menu.